During this period in Pittsburgh, the skyline took shape and many of the buildings are still prominent in the cityscape. Continuing with earlier building projects, the new wave of buildings were constructed on or near the Grant Street business district. The next generation of skyscrapers started in the late 1920s with the construction of the Grant Building (1928) and the Koppers Building (1929). Quickly following was the Gulf Building (1932) which was located right next to the Koppers Building. The Grant Building succeeded the First National Bank Building in 1928 as the tallest skyscraper in the city. The title was short-lived after the Gulf Building was completed in 1932. The Gulf Building held the title for over 38 years until the US Steel building was built. The Koppers Building was built between 1927 and 1929 of Indiana limestone. 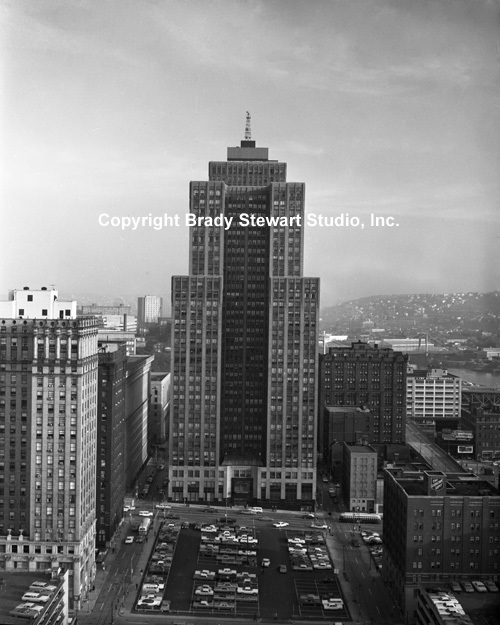 Located at 436 7th Avenue, Pittsburgh, it is 475 feet tall, with 34 stories of commercial offices. Koppers occupies five floors of the building. 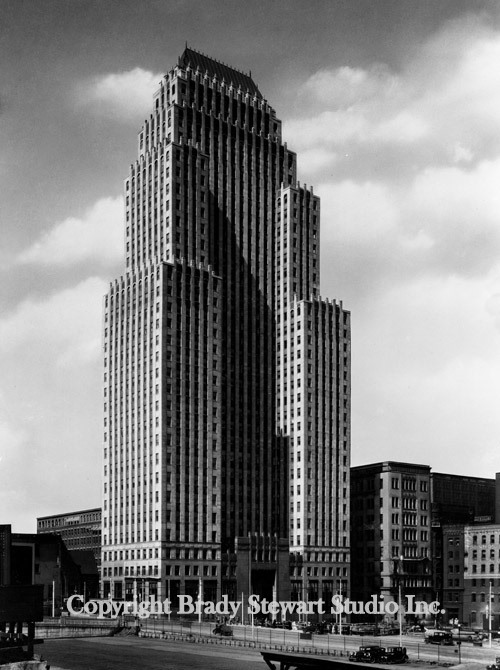 When it was built-in 1928, the Grant Building was the tallest and most prestigious building in the City of Pittsburgh. It is on Grant Street’s premier business location, adjacent to the City-County Building and Allegheny Count y Courthouse. Renowned architect Henry Hornbostel, pictured right, created a building in the classic Beaux Arts style to compete with the great high rises of the early twentieth century. Developers spared no expense, cladding the building in Swedish Granite at its base and topping the building with a flamboyant neon tower that spells out P-I-T-T-S-B-U-R-G-H in Morse Code. Like the Empire State Building, the Grant Building with its mast helped aviators to locate their way. Both buildings became iconic symbols of their cities. The list of tenants occupying the Grant Building through the years reads like a Who’s Who of successful power brokers. Today the building houses respected attorneys, judges, and financiers. McKnight Realty Partners has undertaken an ambitious restoration of the Grant Building to align the Class A building with their signature project, Heinz 57 Center. Built as the headquarters for the Gulf Oil Company, and known as the Gulf Building, the structure was designed by the firm of Trowbridge & Livingston and completed in 1932. Prior to the late 1970s, the entire multistory “step-pyramid/mausoleum” structure at the top of the building was neon-illuminated, changing colors to provide a weather forecast that could be seen for many miles. Subsequently, however, the weather forecasting role has been limited to the weather beacon at the pinnacle of the pyramid, which glows blue for precipitation and red for fair weather. 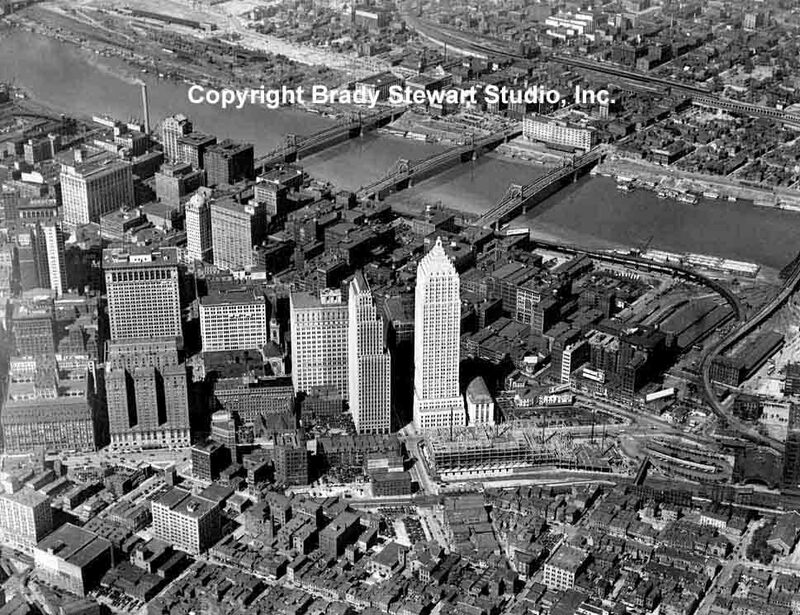 Major construction projects around the city were far and few between during the Depression era (1932-1938) and also during World War II (1941-1945). After the war, government and civic leaders worked together to create a blueprint for the next era in the city’s evolution called Renaissance 1. The Historical Society of Mount Lebanon took a historic journey into the snapshots of Pittsburgh’s past last week when the organization hosted a speaking event about the photography of Brady Stewart Jr. and Sr.
Once an army photographer, Stewart left a legacy in his images. 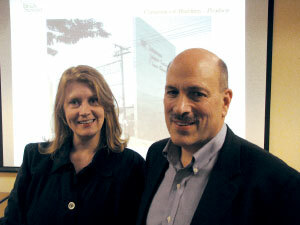 Decades of pictures tell stories about southwestern Pennsylvania. He and his father documented important hometown events such as Pittsburgh’s devastating 1936 flood and the grand opening of Pittsburgh International Airport in 1952. Margaret Betzler Jackson, president of the Historical Society of Mount Lebanon, commented, “When I got on the Brady Stewart website to look at the pictures, I immediately realized this was a program we had to have.” She contacted his son, Mike Stewart, to come speak to HSML. Now, the Stewart family is carefully going through hundreds of photographs and over 90 years of Pittsburgh history, cataloging images and putting them online. The pictures are available for the public to purchase duplicates. To learn more about the collection, or to view photographs online, go to www.bradystewartphoto.com. All images in the blog and web site are copyrighted by Brady Stewart Studio Inc. If you are interested in downloading an image or to purchase a print, please contact Brady Stewart Studio by phone (724.554.9813) or email bstewartphoto@aol.com.